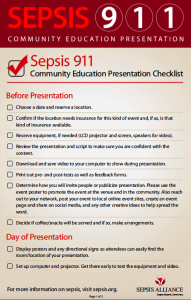 The Sepsis and Aging Community Education Presentation is a leader-guided presentation that allows anyone (members of the public, health providers, educators) to share information about sepsis with their community. Expanding on the original Sepsis 911 Community Education Presentation, this new presentation focuses specifically on issues related to aging and how older people are at higher risk for developing sepsis. Grassroots initiatives like this help more people learn about this life-threatening condition and we know that being knowledgeable about sepsis can help save lives.